It’s so great to watch the number of cycling families grow during Bike to School Month. I have noticed a pattern since we started organizing Bike to School Month last year. At the beginning of the month, the number of cycling parents and kids isn’t that impressive. 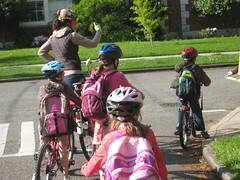 This year a dozen or so families biked to school on a daily basis the first week. But as the month progresses, (and the weather improves) more and more families join the fun and start riding bikes to school. Is it momentum? Is it peer pressure? Does it just look like fun? Kids see their friends riding to school and it looks like so much fun, they want to do it too. Those kids convince their parents to give it a try. As more and more families join in, the bike racks fill up. And pretty soon bikes are spilling into the garden and being locked to any available stationary object. Sometimes they aren’t locked at all (who is going to steal a kid’s bike from a school playground anyway). I’m not sure how the momentum builds. What I do know is: I’m still seeing new faces at the bike racks every day(and they’re all smiling faces). Thanks to all of the parents who have given biking a try. You’re doing your kids a huge favor, and hopefully you’re having some fun too! Does anyone have Bike to School stories to share? This entry was posted in alternative transportation, bigger than here, bikes, neighborhoods, School and tagged Bike to School Month, kids, School, seattle. Bookmark the permalink. We aspire to organize a Bike to School month next year but we did attempt a small Bike to School Day two weeks ago. It rained of the first date, quite sunny on the make-up date. The ‘regular’ bike commuting folks all made sure they were on their bikes and a few more families joined in, which was fun to see. We definitely need to promote it more and I am inspired to see the participation from your parent body.